AT A CERTAIN AGE, THE DREADED B-WORD IS LIKELY TO COME UP WHEN DISCUSSING THE ELUSIVE EVERLASTING BEAUTY. Yes, botox. For those who are a bit ambivalent about injecting poison into your pores, we’ve consulted our resident acupuncture expert Catherine Cusumano who broke down the basics of facial acupuncture, which we have discovered is a more holistic, less invasive way to give you that tight, plump complexion we all yearn for. The best part? Venom’s not included. Acupuncture Facial Rejuvenation involves tiny inter-dermal needle insertion under the deep wrinkles around the mouth, in the furrow lines between the eyes and on the forehead. The needle insertion causes collagen to rush to these areas and fill in and reduce the depth of the wrinkles. It has the added benefit of increased blood flow and lymphatic drainage which reduces puffiness and provides better circulation to the skin allowing for a more youthful appearance. Is that similar to the way Botox works? Botox works by paralyzing the muscles in the face with a live bovine (cow) virus. As many people know when it comes to muscle, “if you don’t use it, you lose it.” This immobilization of the facial muscles causes them to atrophy. If, for any reason, you decide to stop using Botox the muscles in your face will droop and sag dramatically. When you factor in that you are injecting a live virus not only into your body but into your face, it seems very extreme. Because it is. Are there any risks to facial acupuncture like, say, with a face life? 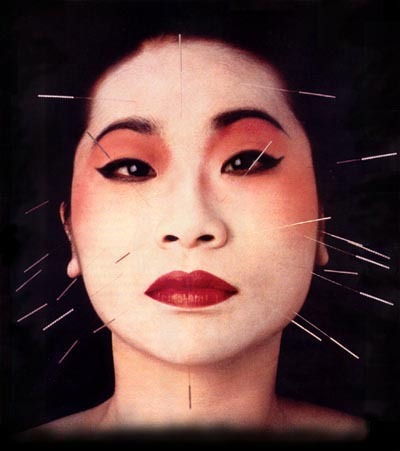 Acupuncture facial rejuvenation is not a face lift. It is for deep and fine lines, reduction of puffiness and increased blood flow. It is also drug free, side-effect free, very low risk and you can stop any time with no negative repercussions. No injections, no drugs, no Botox. Catherine Cusumano has been practicing acupuncture since 2004 and treats everything from acid reflux to migraines to insomnia. She received a Master of Science in Acupuncture in New York where she studied Traditional Chine Medicine, Japanese and trigger point release style acupuncture.